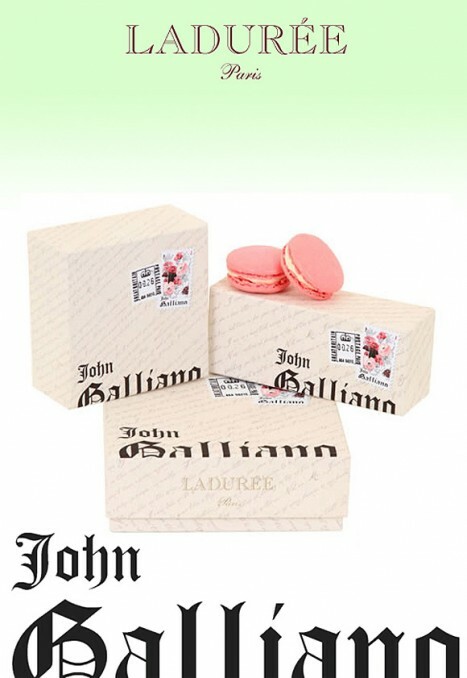 High on John Galliano's list of loves in Paris is Ladurée. The celebrated pâtissier was inspired by the rose and ginger notes of the designer's romantic new fragrance, Parlez-moi d'Amour, to create the unique, John Galliano Macaroon. The macarons come in boxes of either six, twelve, or eighteen and are available exclusively from Ladurée stores in the UK, France, Switzerland, Monte Carlo, Italy, Ireland and Japan. This isn’t Ladurée first co-venture with fashion. In 2009, the french patisserie launched two other special versions of les macarons, one by the french shoe designer Christian Louboutin and one by the Italian label Marni.